CRAWFORDSVILLE, Ind. –- The No. 7 Mount Union wrestling team will compete at the NCAA Central Regional at Wabash College this weekend, February 22-23. The top three finishers in each of the 10 weight classes will advance to the NCAA Division III Wrestling Championships taking place March 8-9 in Roanoke, Va. at the Berglund Center. Mount Union has four returning regional-placers in Nolan Wochna (Brecksville/Brecksville-Broadview Heights), Luke Hernandez (Nashport/Tri-Valley), Michael McIntire (Wadsworth/St. Vincent-St. Mary) and Jairod James (Bedford). Wochna, McIntire and James went on to qualify for the Division III National Championships, with James claiming the title at 174 pounds in Cleveland, Ohio. Wochna finished second in the region last season at 133 pounds. Now competing at 125 pounds, Wochna is 8-6 on the year. Also with a second place finish was McIntire at 157 pounds. After moving up to 165 pounds this season, McIntire holds an overall record of 27-9 with 17 of his victories decided by pin-fall. Defending national champion, Jairod James, returns to the regional tournament as the No. 2 ranked 174-pounder in the country. James is currently 29-4 on the season with only one loss coming from a Division III opponent. 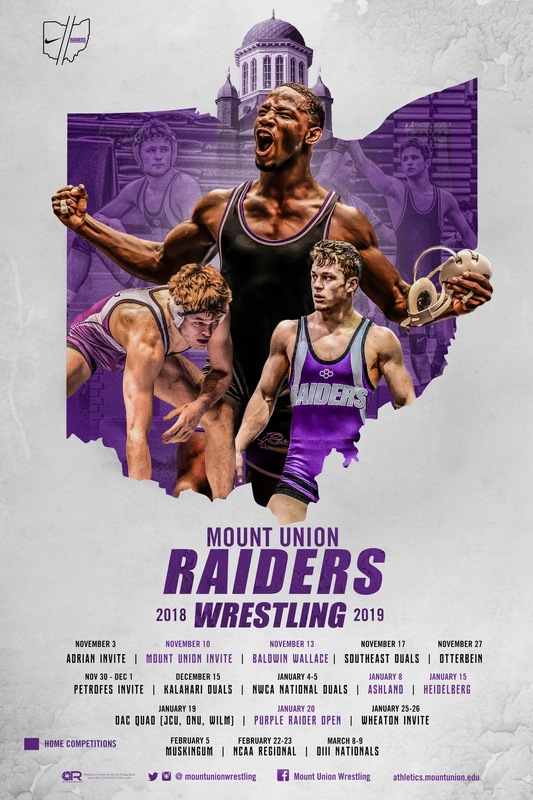 This past December, James was the first Mount Union wrestler to compete at the 56th Annual Ken Kraft Midlands Championships against several Division I wrestlers for a seventh place finish. Hernandez returns to Wabash at 149 pounds after a sixth place finish last year. The sophomore captain currently stands at 26-8 and recently joined the national rankings at No. 10 after back-to-back wins against the No. 4 and No. 2 wrestlers in the country to win the title at the Pete Willson Wheaton Invitational. As a team, the Purple Raiders have a dual record of 17-3, 6-0 in the Ohio Athletic Conference. Other nationally-ranked team competing in the central regional are No. 4 host Wabash (Ind. ), No. 5 Baldwin Wallace and No. 15 Olivet (Mich.).